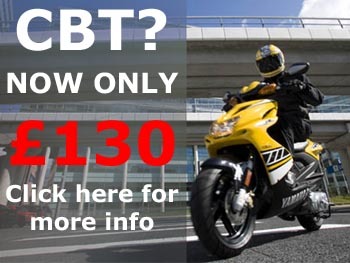 Welcome to ADT Motorcycle Training, for CBT in Southampton every day of the week. Our CBT training courses are conducted to the highest standard and your safety is our highest priority. Our CBT courses take place on DSA approved training sites by DSA approved instructors on modern motorcycles and mopeds. Our dedicated and enthusiastic full-time team are experienced with a range of pupils, from those who have never ridden motorcycles or mopeds before, or who have never used the road before, to experienced road users and motorcyclists. We at ADT understand that your CBT should be tailored to your own needs, based on your current ability and experience. CBT begins with a classroom session on safety equipment. The CBT course progresses onto moped/motorcycle safety checks and controls. Next up is the off-road manouver training, then a classroom road-safety session, and finally at least 2 hours of on-road riding in and around Southampton and the surrounding areas, Totton, Romsey, the New Forest, Eastleigh. For more information on CBT, visit our main site. If you'd like to get in touch, use our contact page now. *Car license holders who passed their car driving test before 2001 may ride a 31mph Moped without L-plates and without completing a CBT, anything bigger or faster requires at least a CBT to ride on the road.